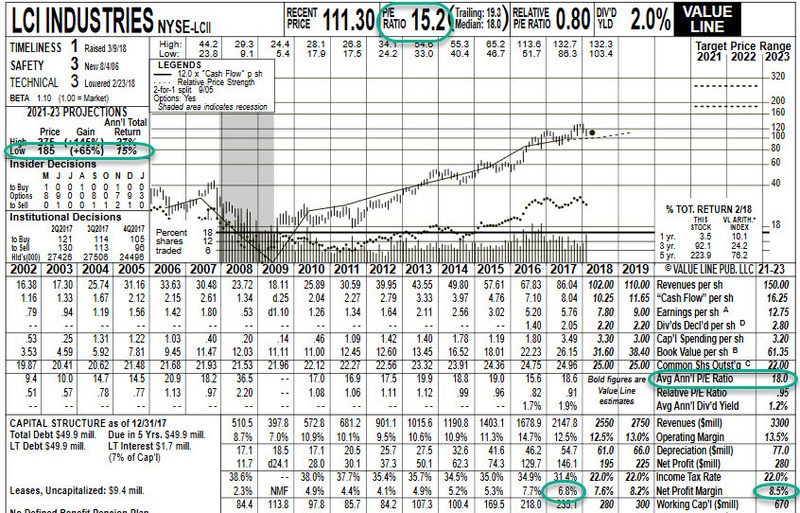 This article is a current example of the type of company analysis Manifest Investing (and our friends) performs on stocks following the time-honored (since 1941) methods of the modern investment club movement. CVS is the 10th most widely-followed stock by our community of investors and is the 2nd most frequently-selected stock during our monthly FREE webcasts known as our Investing Round Table. Note: The 9-year annualized rate of return for the stocks featured is 15.5%. Start a test drive (trial subscription) at http://www.manifestinvesting.com ($79/year, group discounts for club partners and educators) and see the answers to some natural “next” questions including: (1) What about store growth? and (2) How much did Warren Buffett overpay for Heinz and did CVS pay too much for Aetna? Cy Lynch warned all of us as he selected CVS Health (CVS) again for the February Round Table. CVS now ranks as the 2nd most frequently selected company for the tracking portfolio. Cy’s warnings? (1) You can’t lean on the rear view mirror for this one. The historical data doesn’t include Aetna. (2) The fear and herd-following among the Rhinos has delivered some painful price action. [Note: The Rhinos just could be right.] 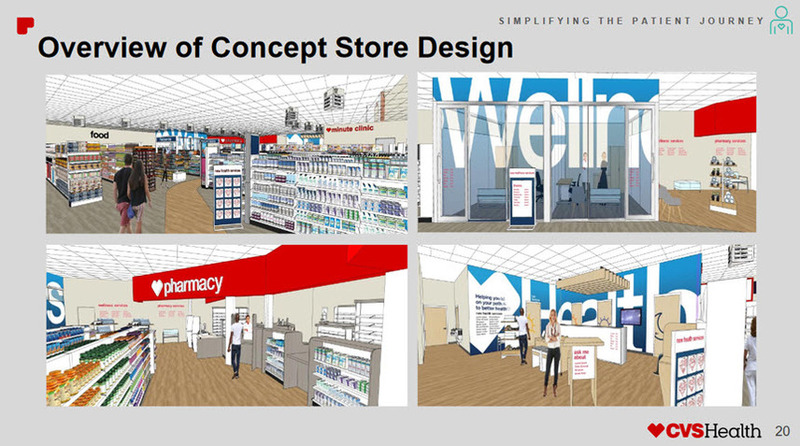 (3) CVS is undergoing a high risk (general perception) transformation from the current business model to one that seeks to optimize wellness, decrease dependency on pharmaceutical band-aids (!!!) and fight to establish an effective go-to solution that serves customers with a cost effective path to health. My personal opinion is that it boils down to remembering and realizing that CVS is the company that discontinued the sale of cigarettes a few years ago to a chorus of whining and Armageddon commentary from the Rhinos. This is massively challenging but a mission with merit. This core holding — at least temporarily — has shifted from blue chip stalwart to execution-based speculation. But it’s a good speculation based on the promises delivered by excellent management over the past several years. The investing jungle is full of doubting Rhinos and the stock price has been mightily challenged, accordingly. That said, the expectations (4% growth, 3.5% profitability, 11.5x average P/E) are the types of low bars that investors like Graham and Buffett have vision cast as stepping over them while others assail the assortment of 7-foot high jump bars with other opportunities. Imagine them ripping out the chips and candy and recapturing the space with cost-effective access to doctors, physician’s assistants, nurse practitioners and various flavors of therapists and nutritional campaigns. Imagine America taking a few less pills and feeling comprehensively better. CVS ripped out the smoking products. How challenging is it to believe that they just might be serious about the rest of this? Contact Mark Robertson via markr@manifestinvesting.com or via Twitter by reaching out to @manifestinvest. Manifest Investing also maintains a “slipstream blog” at Facebook: https://www.facebook.com/manifestinvesting/ Comments and inquiries welcome. Our Fave Five essentially represents a listing of stocks with favorable short term total return forecasts (1 year, according to Analyst Consensus Estimates, or ACE) combined with strong long-term return forecasts and good/excellent quality rankings. The median 1-year ACE total return forecast is 14.8%. (3) may also cause higher P/E ratios, or P/E expansion. Long & Short Term Perspectives. (May 11, 2018) Projected Annual Return (PAR): Long term return forecast based on fundamental analysis and five year time horizon. Quality Ranking: Percentile ranking of composite that includes financial strength, earnings stability and relative growth & profitability. 52-Week Position: Position on scale between 52-week low price and 52-week target price. VL Low Total Return (VLLTR): Low total return forecast based on 3-5 year price targets via Value Line Investment Survey. Morningstar P/FV: Ratio of current price to fundamentally-based fair value via www.morningstar.com S&P P/FV: Current price-to-fair value ratio via Standard & Poor’s. 1-Year ACE Outlook: Total return forecast based on analyst consensus estimates for 1-year target price combined with current yield. The data is ranked (descending order) based on this criterion. 1-Year S&P Outlook: 1-year total return forecast based on S&P 1-year price target. The relative/excess return for the Fave Five tracking portfolio is +2.3% since inception. The absolute annualized rate of return is 16.7%. Irish Spring. We could use a bit of that in the upper Midwest. Wisconsin is in triage from all that snow last week. So we’ll turn to a variant of Hugh’s Irish Stew of excellent companies with attractive return forecasts that are trading near their 52-week lows. Our Fave Five essentially represents a listing of stocks with favorable short term total return forecasts (1 year, according to Analyst Consensus Estimates, or ACE) combined with strong long-term return forecasts and good/excellent quality rankings. The average 1-year ACE total return forecast is 13.4%. Hugh has reminded us in the past that it’s not as simple as a percentage difference between the current price and the 52-week low. As shown here, it’s more of a range. The lower limit is indeed the 52-week low. But the higher limit of the range is a 1-year price target based on projected earnings and P/E ratio — using our assumptions for growth, profitability and long term valuation. A stock trading near its 52-week low would have a “position-in-range” of 0%. Long & Short Term Perspectives. (April 20, 2018) Projected Annual Return (PAR): Long term return forecast based on fundamental analysis and five year time horizon. Quality Ranking: Percentile ranking of composite that includes financial strength, earnings stability and relative growth & profitability. 52-Week Position: Position on scale between 52-week low price and 52-week target price. The data is ranked (ascending order) based on this criterion. VL Low Total Return (VLLTR): Low total return forecast based on 3-5 year price targets via Value Line Investment Survey. Morningstar P/FV: Ratio of current price to fundamentally-based fair value via www.morningstar.com S&P P/FV: Current price-to-fair value ratio via Standard & Poor’s. 1-Year ACE Outlook: Total return forecast based on analyst consensus estimates for 1-year target price combined with current yield. 1-Year S&P Outlook: 1-year total return forecast based on S&P 1-year price target. The relative/excess return for the Fave Five tracking portfolio is +5.1% since inception. The absolute annualized rate of return is 18.5%. Our Fave Five essentially represents a listing of stocks with favorable short term total return forecasts (1 year, according to Analyst Consensus Estimates, or ACE) combined with strong long-term return forecasts and good/excellent quality rankings. The median 1-year ACE total return forecast is 16.2%. Our five stocks this week hail from the top quintile (top 20%) of all stocks ranked by quality. We then sought the five highest 52-week total return forecasts according to analyst consensus. NutriSystem (NTRI) rejoins the Fave Five tracking portfolio after a brief hiatus. NTRI was selected back on 11/9/2017 and proceeded to recede more than 20% versus the general stock market, so it was jettisoned about a month ago. With the stock price dropping from $51 to $28, we’ll give it another go — but with a careful watch on the quality rating. Slowing of sales growth with 2017 year-end resembling 2016 is causing some consternation and we’ll keep the company under the microscope with the 4/19/2018 update. 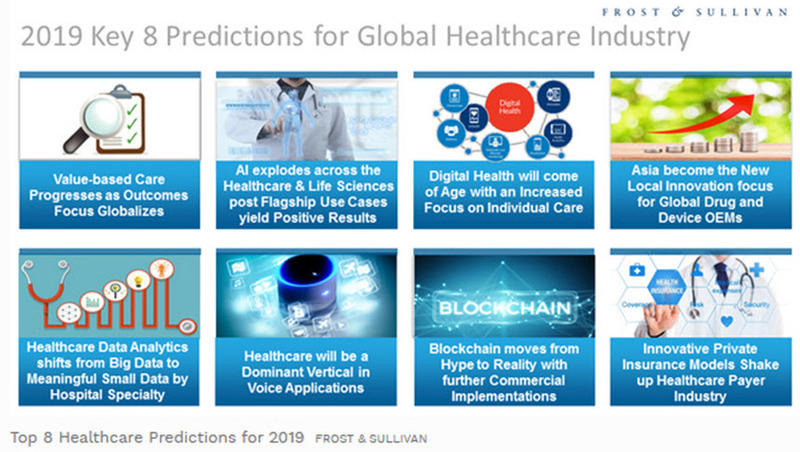 CVS Health (CVS) has appeared frequently in Fave Five results and is featured in a number of portfolios, including its #12 ranking in the MANIFEST 40 most widely-followed companies. 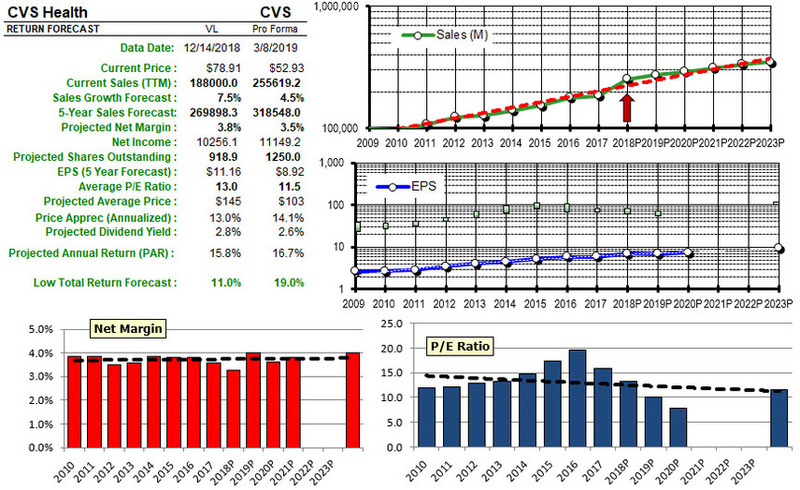 CVS was first added to the Fave Five tracking portfolio back in December 2015 … and has been fairly disappointing with a return of (-10.1% annualized) since selection. We also note that CVS Health has been showing up on a number of Triple Play screening results, so we’ll continue to hope that earnings will advance … and that stock price will follow EPS. Long & Short Term Perspectives. (March 23, 2018) Projected Annual Return (PAR): Long term return forecast based on fundamental analysis and five year time horizon. Quality Ranking: Percentile ranking of composite that includes financial strength, earnings stability and relative growth & profitability. 52-Week Position: Position on scale between 52-week low price and 52-week target price. VL Low Total Return (VLLTR): Low total return forecast based on 3-5 year price targets via Value Line Investment Survey. Morningstar P/FV: Ratio of current price to fundamentally-based fair value via www.morningstar.com S&P P/FV: Current price-to-fair value ratio via Standard & Poor’s. 1-Year ACE Outlook: Total return forecast based on analyst consensus estimates for 1-year target price combined with current yield. The data is ranked (descending order) based on this criterion. 1-Year S&P Outlook: 1-year total return forecast based on S&P 1-year price target. The relative/excess return for the Fave Five tracking portfolio is +4.7% since inception. The absolute annualized rate of return is 17.8%. Our Fave Five essentially represents a listing of stocks with favorable short term total return forecasts (1 year, according to Analyst Consensus Estimates, or ACE) combined with strong long-term return forecasts and good/excellent quality rankings. The median 1-year ACE total return forecast is 14.7%. By the way, the ferocity of the correction is on full display here, the median 1-year ACE total return was 1.7% just a couple of weeks ago. That reality, the bolstering fundamentals and a relative strength index that is creeping into “oversold territory” are among the reasons that diligent shopping can be pursued. This week’s Fave Five will be a parade of several of our favorite screens, including the traditional long/short outlook, best in zone, launchpad ready, Triple Play qualified, etc. Long & Short Term Perspectives. (February 9, 2018) Projected Annual Return (PAR): Long term return forecast based on fundamental analysis and five year time horizon. Quality Ranking: Percentile ranking of composite that includes financial strength, earnings stability and relative growth & profitability. 52-Week Position: Position on scale between 52-week low price and 52-week target price. VL Low Total Return (VLLTR): Low total return forecast based on 3-5 year price targets via Value Line Investment Survey. Morningstar P/FV: Ratio of current price to fundamentally-based fair value via www.morningstar.com S&P P/FV: Current price-to-fair value ratio via Standard & Poor’s. 1-Year ACE Outlook: Total return forecast based on analyst consensus estimates for 1-year target price combined with current yield. The data is ranked (descending order) based on this criterion. 1-Year S&P Outlook: 1-year total return forecast based on S&P 1-year price target. Reminder: These are companies exhibiting HUGE 2018 EPS forecasts versus 2017 projected/actual results. This is just a one year condition for this screen. Ideally, a stock with multi-year breakthrough and breakout potential could be discovered. Stocks exhibiting these characteristics have delivering participating clubs and individuals to the Groundhog Winner’s Circle in the past. This group has decent (out-sized) long term return expectations in combination with the potential for P/E expansion and profitability/margin enhancement. These are the consensus selections — the most commonly selected stocks — among the Groundhog Challenge entries for 2018. The relative/excess return for the Fave Five tracking portfolio is +4.8% since inception. The absolute annualized rate of return is 18.1%. Our Fave Five essentially represents a listing of stocks with favorable short term total return forecasts (1 year, according to Analyst Consensus Estimates, or ACE) combined with strong long-term return forecasts and good/excellent quality rankings. The median 1-year ACE total return forecast is 7.2%. We continue to leave the 52-week “position”, a factor that combines with 1-year total return for the short term outlook. Walter Schloss loved to find vetted high-quality companies with solid expectations that were trading near the low end of a 52-week range. This week’s short list has all the usual attributes over the long term, the next year (or short term) and also is expected to grow at double-digit rates, precisely the type of treat that we seek to discover going into the holiday season this year. Long & Short Term Perspectives. (November 17, 2017) Projected Annual Return (PAR): Long term return forecast based on fundamental analysis and five year time horizon. Quality Ranking: Percentile ranking of composite that includes financial strength, earnings stability and relative growth & profitability. 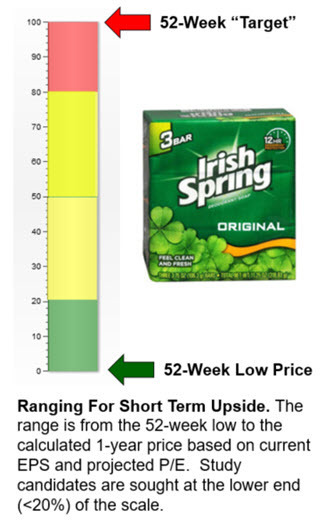 52-Week Position: Position on scale between 52-week low price and 52-week target price. VL Low Total Return (VLLTR): Low total return forecast based on 3-5 year price targets via Value Line Investment Survey. Morningstar P/FV: Ratio of current price to fundamentally-based fair value via www.morningstar.com S&P P/FV: Current price-to-fair value ratio via Standard & Poor’s. 1-Year ACE Outlook: Total return forecast based on analyst consensus estimates for 1-year target price combined with current yield. The data is ranked (descending order) based on this criterion. 1-Year S&P Outlook: 1-year total return forecast based on S&P 1-year price target. The relative/excess return for the Fave Five tracking portfolio is +5.3% since inception. The absolute annualized rate of return is 20.6%. Our Fave Five essentially represents a listing of stocks with favorable short term total return forecasts (1 year, according to Analyst Consensus Estimates, or ACE) combined with strong long-term return forecasts and good/excellent quality rankings. The median 1-year ACE total return forecast is 11.1%. The Long & Short. (September 29, 2017) Projected Annual Return (PAR): Long term return forecast based on fundamental analysis and five year time horizon. Quality Ranking: Percentile ranking of composite that includes financial strength, earnings stability and relative growth & profitability. VL Low Total Return (VLLTR): Low total return forecast based on 3-5 year price targets via Value Line Investment Survey. Morningstar P/FV: Ratio of current price to fundamentally-based fair value via www.morningstar.com S&P P/FV: Current price-to-fair value ratio via Standard & Poor’s. 1-Year ACE Outlook: Total return forecast based on analyst consensus estimates for 1-year target price combined with current yield. The data is ranked (descending order) based on this criterion. 1-Year S&P Outlook: 1-year total return forecast based on S&P 1-year price target. The rate of return for the tracking portfolio is 21.6% since inception. The relative/excess return for the Fave Five tracking portfolio is +6.1% since inception.